A stone plate falls onto the ground. The simulation results are rendered using (top row) mesh and spherical particles, and (bottom row) geometric shape reconstruction methods at different time steps (in simulation time). 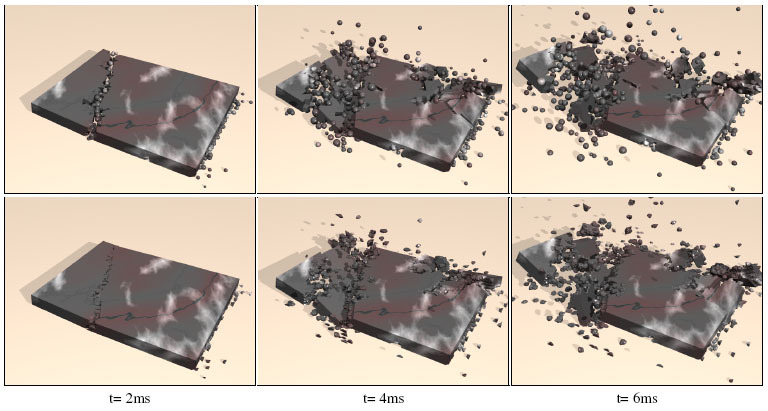 Nan Zhang, Xiangmin Zhou, Desong Sha, Xiaoru Yuan, Kumar K. Tamma and Baoquan Chen, "Integrating Mesh and Meshfree Methods for Physics BasedFracture and Debris Cloud Simulation." In Proceeding of the 3rd Eurographics Symposium on Point-Based Graphics. Pages 145-154, 2006.